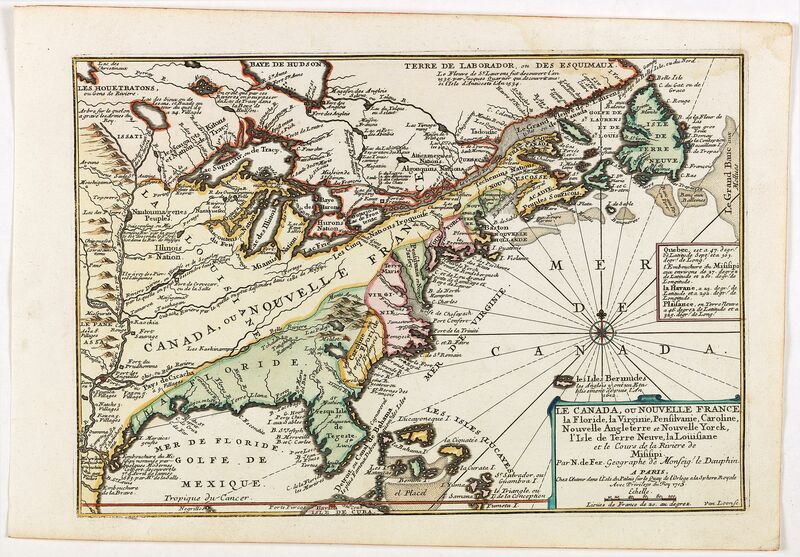 Old map by DE FER - Le Canada, ou Nouvelle France la Florida, la Virginie, Pensilvanie . . . Title: Le Canada, ou Nouvelle France la Florida, la Virginie, Pensilvanie . . . Size: 9.4 x 13.5 inches. 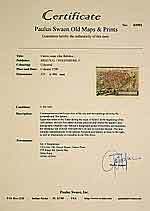 Condition: Paper very slightly age toned, water staining in the top right corner, otherwise in fine condition, dark impression. Together with an engraved text sheet giving a description of the region in French. Fine map is showing the east coast of the United States from the Caribbean up to Newfoundland, with the western border just beyond the Mississippi. The course of the Mississippi is virtually due North, originating in Texas and extending into Canada. The many rivers which feed the Mississippi are described and often annoted, most notably the Ohio ou Bell Riviere, which starts far south of its true origins and the Oubache River. The extent of Canada ou Nouvelle France is extended far to the south and the size of the English Colonies substantially reduced, undoubtedly a political statement. Notes on early explorations, forts, rivers and Indian Tribes.